Come experience authentic foods, and exciting entertainment at Salt Lake City’s annual Greek Festival. The lively event often attracts up to 50,000 attendees and also features art displays and both 5K and 10K runs. OPA!! Welcome to the Greek Festival. 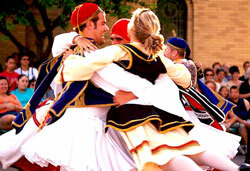 Here you will witness a variety of traditional Greek folk dances performed by our dance groups. The suite of dances will consist of Pan-Hellenic dances (danced throughout Greece with regional variances) and dances from the mainland and islands. The most popular form of the Greek folk dance is the open circle, with regular handhold position, moving counter-clockwise. Next is the straight line with arms on shoulders of adjacent dancers. The third form is the curved-line dance with the basket-weave hold.